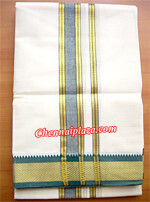 Item Description Pure Cotton dhothi with zari border and mayilkan design. Item Description Pure Cotton dhoti with maroon and green coloured zari designer border and mayilkan design. 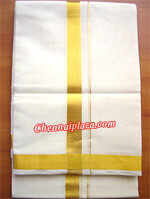 Item Description Elegant golden colour zari border design dhothi. 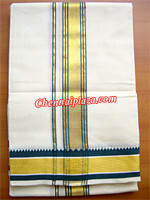 Item Description Cotton classic white dhoti and a pure white shirt bit measuring 2 mts.